Welborn Lake meeting planned today – Welcome to Wyandotte Daily! A meeting on the future of Welborn Lake will take place from 4:30 to 7 p.m. Thursday, Feb. 15, at Christ the King Church, Davern Hall, 53rd and Leavenworth Road. The meeting, open to the public, is expected to explore ways to clean up the private lake, near 48th and Leavenworth Road. 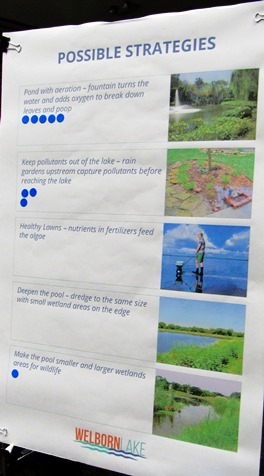 An effort is underway on the part of the Unified Government Public Works Department and Shockey Consultants to get community comments on the lake and explore what should be done with it. The lake was covered with algae and an area conservationist stepped forward to look at it and help start cleaning it up last year. Cleaning up the lake has been a long-time goal of the Leavenworth Road Association. An earlier meeting was held Nov. 28 at the West Wyandotte Library on Welborn Lake. After reviewing comments from that meeting, the consultants are expected to come up with some proposed solutions. The meeting on Feb. 15 will be a come-and-go meeting. There might be some discussion about what the Leavenworth Road modernization will look like at Welborn Lake, and also, about storm drainage overflow, according to Lou Braswell, executive director of the Leavenworth Road Association.